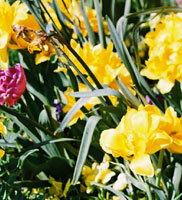 Living AIDS Memorial Garden | AIDS awareness project. > View more. . . The mission of this organization shall be to establish and maintain a Garden in memory of those who have died of AIDS, provide a place of reflection for those who are living with AIDS, and for those who are survivors. We hope this Garden will serve West Virginia and the surrounding states. The small plot at the corner of Washington Street East and Sidney Avenue has become a haven of beauty and tranquility in an area that teems with activity from the nearby Capitol Complex. 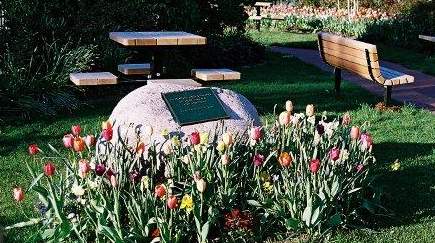 Members of the nonprofit Living AIDS Memorial Garden Inc. have worked since 1998 to turn the site into a place to honor the memories of those who have lost their lives to the disease, and to provide a place of reflection for survivors and people living with the illness. A funding mix of private donations, corporate contributions, government grants and an annual benefit, the Dance for Those Who Can’t, has allowed garden organizers to create a blooming expanse that includes wildflowers, trees and roses. “We try to have a progression that goes from daffodils and tulips in the spring to iris and allium to daylilies, followed by the black-eyed Susans and then the mums in the fall,” said Bruce Severino, who co-founded the group along with Carl Maxwell and the late Jeffrey Huff.